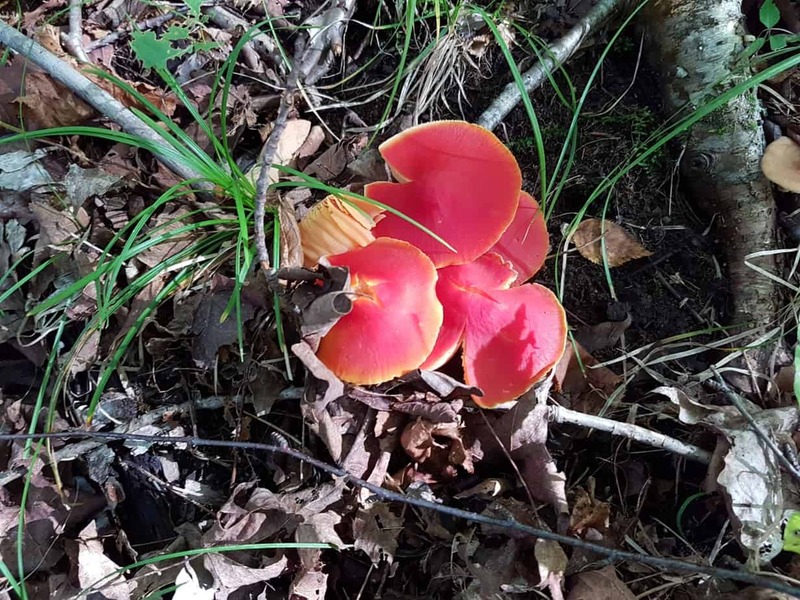 Walking through the woods and fields of the Kawarthas in early October when the landscape is ablaze with colour is a fall tradition for many local residents. Not only do you feel closer to friends and family, but there is an indelible “sense of place” and connection to the land. Over the last week or so, my wife and I have had the pleasure of discovering some of the new public trails established by the Kawartha Land Trust (KLT). If you are looking to add some exercise and nature-appreciation to your Thanksgiving weekend, I can’t think of any better destinations. 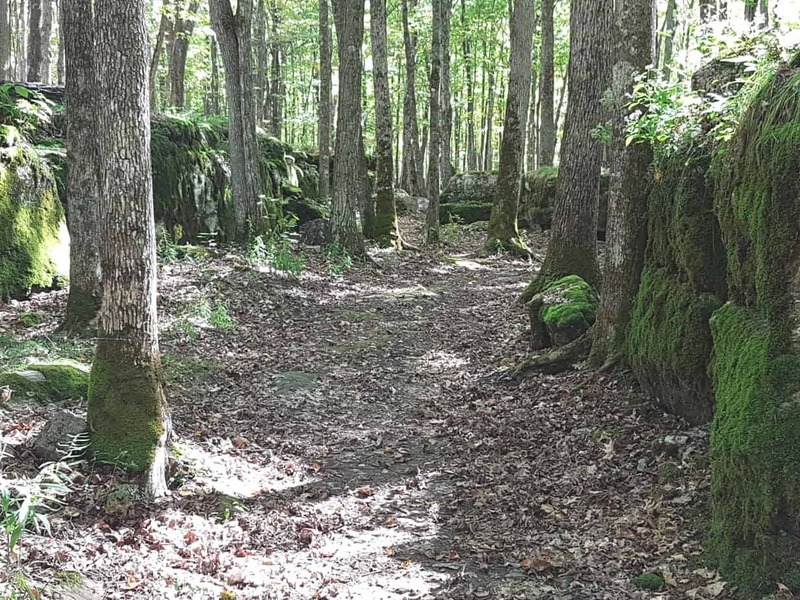 Formerly known as the Kawartha Heritage Conservancy, the KLT is a not-for-profit charitable organization committed to protecting the land we love. The Trust works with landowners and community members to identify and protect key ecological features of the Kawarthas. The KLT acquires a protective interest in land by receiving land donations or by managing properties, many of which have significant cultural value. The organization can also enter into long-term conservation agreements and provide professional advice about creative land conservation approaches. 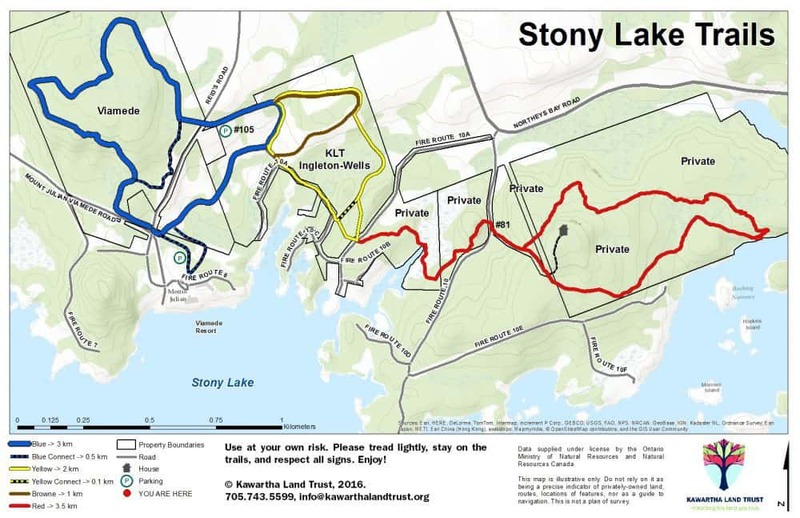 The KLT trails now open to the public include three on the north shore of Stony Lake, one on Boyd Island near Bobcaygeon, and five on the McKim-Garsonnin property (Ballyduff Trails) near Pontypool. They are all easy-walking and well-marked with a trail map posted at the main junctions. The Stony Lake and Boyd Island trails are located in the Land Between, which describes the “ecotone” or transition zone between the Great Lakes – St. Lawrence Lowlands to the south and the Canadian Shield to the north. The landscape is characterized by low exposed granite to the north side and limestone plain and outcroppings along the south side. It is home to many rare species and habitats. It’s a happy coincidence that Thanksgiving weekend is usually synonymous with fall nature at its best. All of the KLT trails provide a smorgasbord of the sights, sounds and smells of the season. Red and sugar maples are now approaching peak colour with their vibrant oranges, reds and yellows. The wine-coloured leaves of white ash and the deep reds and maroons of Virginia creeper and staghorn sumac are already at their best. The leaves, however, are only part of the show. The white and mauve blossoms of asters such as the heart-leaved, New England and heath are abundant right now along trails and roadsides. Flocks of yellow-rumped warblers, white-throated sparrows and kinglets are moving through the area and, strangely enough, ruffed grouse can often be heard drumming. If you turn over rocks and logs, now is a good time to find salamanders such as the red-backed and blue-spotted. Of particular interest this year is the wide variety of fungi that have fruited. Fruiting refers to the appearance of the fleshy, spore-bearing body of the fungus, which is typically called a mushroom or toadstool. Thanks to the recent rains, dozens of species can be seen, especially in mixed forests with pine, hemlock beech, birch and poplar. Watch for turkey-tail, artist’s conk, various puffballs and a variety of amanitas, russulas and boletes. Fungi are also a lot of fun to photograph. 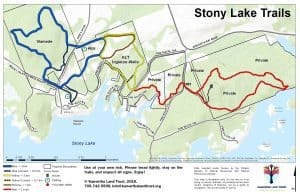 If you want to see rich plant, animal and geological diversity, my first recommendation would be the three interconnected KLT trails located south and west of Northey’s Bay Road on the north shore of Stony Lake. Ten kilometres of easy-walking trails wind through four distinct environments: mostly broadleaf forest on limestone bedrock; mixed forest on Canadian Shield granite; large groves of hemlock trees; and an extensive wetland. All of the trails provide great wildlife-watching possibilities, including deer and wild turkeys. The KLT, neighbouring landowners, donors and volunteers, have worked together to make these publicly accessible trails a reality. If you decide to go, I would suggest leaving the car at Viamede Resort or at the KLT parking lot at #105 Reid’s Road. We parked at the latter location and started our walk by exploring the 2 km Ingleton-Wells trail (yellow) through property belonging to the KLT. Follow the path east along the edge of the open field in front of the parking lot to get to the trailhead. The Ingleton-Wells loop takes you through upland forest of hemlock, birch, maple and bitternut hickory, over granite bedrock. Watch for yellow birch growing on the top of old, disintegrating pine stumps. An old stone wall along the trail attests to the property’s agricultural past, as does an old apple orchard. In the spring, this is a great trail to see wildflowers such as hepatica and Dutchman’s breeches. 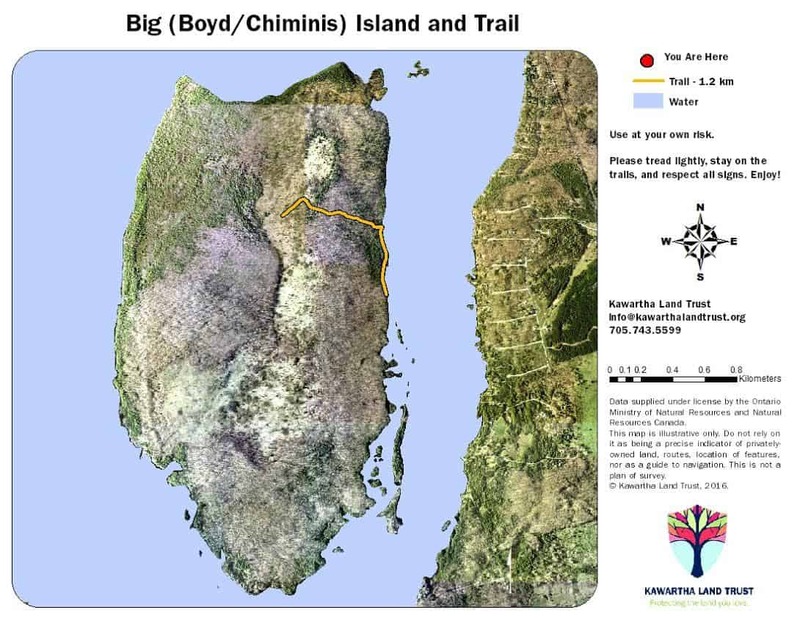 The brown-coded sub-section of this trail takes you through a glacial outwash, which supports southern species like bitternut hickory and butternut. The latter is an endangered species in Ontario. Mature butternuts have distinctive bark with wide, flat-topped ridges. After completing the Ingleton-Wells loop, you can return to the parking lot, have a snack, and then cross Reid’s Road to do the 3 km Viamede Trail (blue). The bedrock here is mostly limestone. The first 50 metres or so is particularly rich in mushrooms. Turn right at the T-junction and follow the blue markers for a kilometre or so to a fascinating section known as “The Chute”. An ancient glacial river eroded the limestone here forming a long, gully-like cut through the rock. 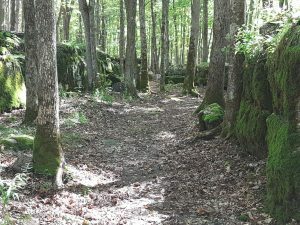 Each side of the trail is bordered by 1-2 metre high limestone “wall” covered in moss and ferns. It is unlike anything I’ve ever seen before. KLT has even erected a bench – one of many on the trails – where you can sit and contemplate the force of the ancient torrent that once flowed through here. When you are walking this trail, be sure to follow the blue markers on the trees, since there are several other paths branching off to the side. You will also see metal baskets and various signs that have been erected for guests at the Viamede Resort who come to play “disc golf”. The 3.5 km red trail provides a great taste of Canadian Shield habitat. It can be accessed from the Ingleton-Wells loop or by parking on the side of the road at #81 Fire Route 10. Like the Viamede trail, this trail winds through private property open to the public thanks to a special agreement with landowners. Just remember to “tread lightly”, stay on the path, and respect all signs. From Fire Route 10, you have two options. If you head west, the trail meanders uphill through a granite outcropping, traverses a mostly birch forest – watch for a huge old maple “den” tree – and then crosses an old beaver dam bisecting a huge marsh. The dam is very rich botanically with species like sensitive fern and winterberry holly. On the west side of the marsh, there are beautiful hemlocks and mature maples. Alternatively, you can head east from Fire Route 10, follow the trail halfway up a steep road and then take the branch to the left. You will enter a majestic grove of hemlocks. The exposed tree roots and granite bedrock are particularly interesting in this section. You will also come to a large pond where salamanders and frogs breed in the spring. Most of the red trail is shaded by a canopy of mature broad-leaved trees and scattered pines and other conifers. Although you can usually see deep into the woods, there is a wonderful feeling of seclusion. 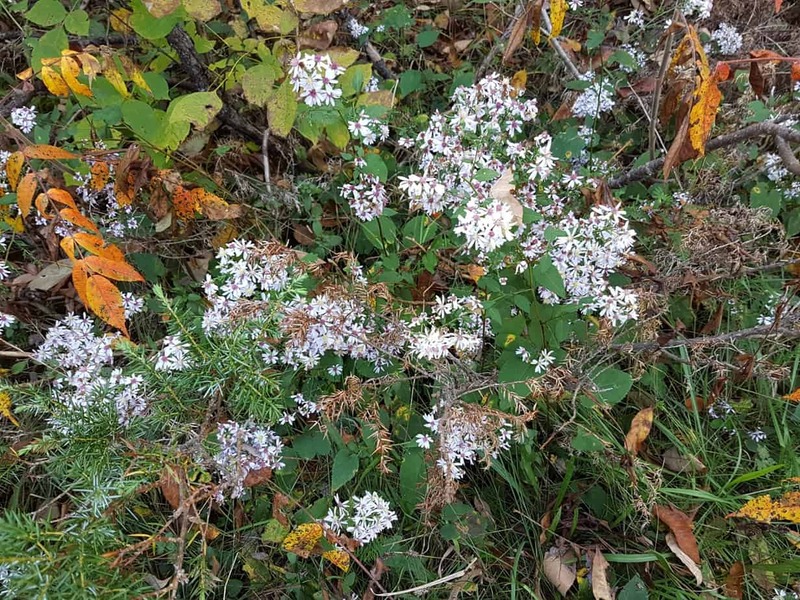 More open areas of the trail are dominated by red and white oaks with shrubs such as blueberry and arrow-wood viburnum growing underneath. The red trail also takes you over lichen-covered granite ridges and past imposing “erratics”. These boulders were transported by glaciers – often from hundreds of kilometres to the north -and deposited when the ice melted. You can wrap up your day with dinner at Viamede Resort (call ahead of time at 705-654-3344) or at Uncle George’s Bakery & Dining (705-654-3661), located just north of Woodview. 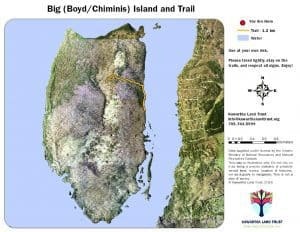 If you are looking to add a little paddling to your KLT trail explorations, consider a trip to Boyd (Big) Island, located on Pigeon Lake near Bobcaygeon. Most of the island was donated to Kawartha Land Trust in 2015. It is the largest undeveloped island in the Kawarthas and home to diverse forests, old meadows and rich flora and fauna. A 1.2 km trail has now been established. The trailhead is about halfway down the east side of the island. A boat launch at the end of Bear Creek Road in Trent Lakes Township gives you the shortest paddling route across. For more information about the Kawartha Land Trust and to print off maps of all the above-mentioned trails, go to kawarthalandtrust.org. You can also contact the Trust at 705-743-5599.